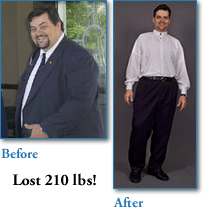 Amazingly my weight has gone from 410 pounds to 200 – Oxycise! “They say a picture is worth a thousand words…I want you to see the amazing results I’ve obtained by using Oxycise! I have been overweight for most of my life. I have been battling weight problems on various diets and exercise programs for years with very little success. In fact with the passing of each year my health continued to decline and I had pretty well given up all hope of ever losing weight let alone being thin again. I began to suffer from high blood pressure, asthma, allergies, high triglyceride levels, high blood sugar levels and worse yet I was suffering from severe GastroEsophogeal Reflux Disorder that was also causing panic attacks. I knew I had to lose the weight to rid myself of these problems. “I started to go to a local gymnasium because I knew that the weight wouldn’t come off as quickly if I didn’t incorporate some sort of exercise program, so I decided to sign up for a ‘spinning class’ (stationary bicycles). Unfortunately my heart rate would get up so high during the class that I thought I was going to suffer a heart attack and this would cause the panic attacks to start again. I was so frustrated because I wanted to exercise, but didn’t know what I could do thinking that I had to exert myself to get any benefit. “That’s when I discovered Oxycise! “At first I was skeptical, but I wanted to do something-anything-to lose the weight. I’m so grateful that I decided to order Oxycise! Level 1. I was able to burn off the excess fat right away and didn’t even break a sweat! The deep-breathing technique you have developed is so effective, so amazing. Not only has it helped me to lose weight, but more than anything I believe the deep-breathing has helped heal my body and restore my overall health. “Since I’ve been doing Oxycise!, my chest measurement has gone from 50.5 inches down to 42.5 inches, but the amazing part is the fact that my lung capacity has gone from 425L/min to 620L/min. My shirt size has gone from a 5X to Large. My waist has gone from pants size 60 inches to 36-inch waist. Even my wedding ring had to be adjusted from a size 14 to 9.5. Amazingly my weight has gone from 410 pounds to 200. Oxycise! has helped me in losing more than half my body weight and I’ve never felt better. Oxycise! has brought about a mighty change and has given me my life back, now I can play with my children instead of being a spectator. “I am so grateful for all that my wife, Francisca, has done to help me. Without her encouragement and support I wouldn’t have been able to accomplish my weight loss goal. She has also had a great deal of success using Oxycise! along with me. She has used Oxycise! to go from 155 pounds to her current weight of 127.5 and she looks great!